Considering the phalanx of albums due for release, and with previous offering Discovery bringing all the musical vision and ingenuity of a series of polyphonic ring-tones, Human After All found itself rated rather low on my list of desires and expectations for the first half of 2005. Being honest, I expected absolutely nothing of real musical value from this album, to the extent that on its release in mid-March, I ignored it entirely, and I doubt I was the only one that did. It's hardly surprising. Given the weight of expectation that had built up in the four years between Homework and Discovery, and the apparent let down many felt by the latter's absence of substance and / or merit, the run in to Human After All was nothing but a small blip on the horizon, both in comparison and in general. Contrasting with the speculation and excitement surrounding Discovery, the past four years seems to have been a little harsher towards Daft Punk, with many not terribly concerned about when, or even if, they were coming back. But they have. From the first, and title track, it's apparent that they've shrugged off the cold, digital mediocrity that surrounded much of the previous helping, with the repeated, "we are human, after all," lyric more than hinting at the irony with which they have done so. To say this is a return to their patented brand of French house doesn't do this album the justice that it deserves, but, in many ways, it is. With much of the music being built in exactly the same way, tracks like "Steam Machine" and "Primetime of Your Life" have all the repetitive glory of the Homework era. However, adjacent to these are the true gems of this album, where house is fused perfectly, and bulked up with spectacularly well-worked (and sometimes synthesized) guitars. It is this trait, and the songs to which it is applied, that is, perhaps, the most memorable concept of this album, with single, "Robot Rock" and the slightly slower "Television Rules the Nation" being two of the more exceptional moments. As I said, however, this description is not a fair summary, simply because it ignores the vast array of tempos and influences that hide just below the surface. "Make Love" is a perfect example of, although I'm loathe to use the term, the maturity that seems prevalent on parts of this album, introducing something close to an ambiance track at a time when it has no right to work, but actually does. Penultimate track, "Technologic" is the defining moment, and, no doubt, apogee of the album. It stands to reason that this is the "Da Funk" or "Around the World" of Human After All, in that it has all the ingredients to become a classic, from the tenacity of the vocal line, which will stay in your head for days on end, to the beat that I dare you not to move a limb, or at least an extremity in time to. Really, it's a pity that it doesn't end here but continues on into "Emotion" - the contrived, slow, downbeat end to an album that too many recording artists fall victim to. In fact, this is the only low point of the album. Considering the length of the song (almost 7 minutes), it doesn't once change pace or concept, but keeps going until it fades away, creating an unfortunate and undeserved metaphor for the album as a whole. 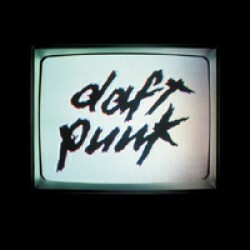 Be warned, Human After All is repetitive, but then, Daft Punk always have been. If you don't dig repetition, steer well clear, but even so, there is more merit and necessity for it now than there ever has been. Believe me when I say that Daft Punk are back. 8.5 / 10 — Neil F.
Posted May 11, 2005, 12:01 p.m.